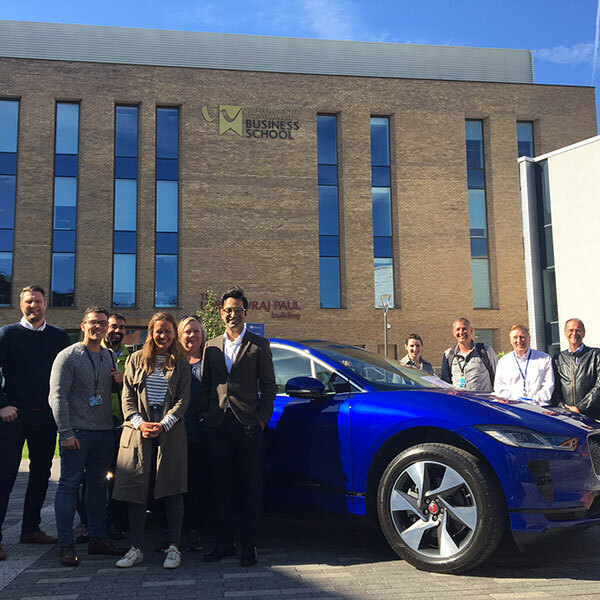 Business students got a taste of life in the fast lane when a new electric Jaguar came onto campus as part of a marketing module. The Master's in Business Administration (MBA) students were given an opportunity to check out the new Jaguar IPACE electric SUV on Tuesday, 25 September 2018. They will be investigating the UK market for prestige electric cars based on identifying new market sectors for the Jaguar IPACE. Lancaster Jaguar in Stafford Street Wolverhampton kindly provided a car for the students to look at ahead of starting their Marketing Management module. MBA student Tracey Lockley said: "This is a real life scenario, electric cars are obviously a growing market. It's an exciting thing to be working on." The visit was a part of a collaborative project between the Business School at the University of Wolverhampton and Jaguar Land Rover. More information about Business courses at the University.